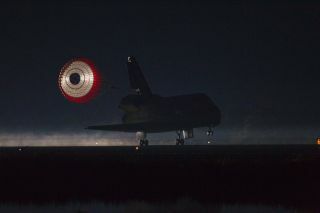 At the Shuttle Landing Facility at NASA's Kennedy Space Center in Florida, the drag chute trailing space shuttle Atlantis is illuminated by the xenon lights on Runway 15 as the shuttle lands for the final time. Securing the space shuttle fleet's place in history, Atlantis marked the 26th nighttime landing of NASA's Space Shuttle Program and the 78th landing at Kennedy. WASHINGTON — NASA hopes to close the books this summer on United Space Alliance's (USA) half-billion-dollar pension shortfall and will likely need to use about $50 million originally budgeted for space shuttle retirement and transition activities to settle the tab. Bill Hill, NASA assistant associate administrator for the space shuttle program, told the NASA Advisory Council during a March 6 meeting in Washington that the latest estimate of USA's pension plan shortfall is $522 million. While that is less than the $548 million NASA estimated needing to pay out when it submitted its 2012 budget request to Congress last year, lawmakers ultimately appropriated just $470 million for the pension liability. NASA was told to make up any difference by diverting some of the nearly $90 million appropriated for other shuttle closeout activities on tap for this year. The value of USA's pension fund, and consequently the amount of the shortfall, fluctuates along with the stocks and bonds that make it up. An updated — and possibly final — estimate is expected in April when USA employees decide whether they want to receive their pension benefits as a lump sum or annuity. NASA is legally obligated to make USA's pension fund whole because the company — a joint venture of Boeing and Lockheed Martin — operated the space shuttle under a cost-reimbursable contract that entitled it to charge NASA for all personnel costs, including retirement benefits. USA switched to a less costly 401(k) retirement savings plan for new hires several years ago. In late 2010, as USA was preparing for an uncertain post-shuttle future, the Houston-based company announced it had begun taking steps to terminate its pension plan. NASA spokesman Michael Curie said the agency expects to transfer payment for the shortfall early this summer once USA and federal regulators formally close out the pension fund. If covering USA's shortfall costs NASA more than the $470 million Congress appropriated for the pension liability, Curie said, NASA will make up the difference by reducing the shuttle closeout activities it has asked USA to perform. "Any shortfall, and we don't want to speculate what it might be, will result in less content in transition and retirement and potentially other programs, if it grows large enough," Curie said March 7. "There is no additional money." USA has struggled to find new business to make up for the loss of its shuttle operations contract, which ends in September. Late last year, USA was instructed by its parent companies to stop seeking new business. USA does not acknowledge the 17-year-old company is being shut down, but NASA officials have begun to treat it as a given. When a member of the NASA Advisory Council asked Hill when USA's remaining shuttle closeout work would be completed, Hill replied, "Between now and when they go out of business." USA employed 10,500 people as recently as 2005 but has been downsizing rapidly since the space shuttle flew its final mission last summer. Fewer than 2,900 people still work for the company, down from 6,300 last March. Another 297 will be laid off mid-April, according to Fluegel.